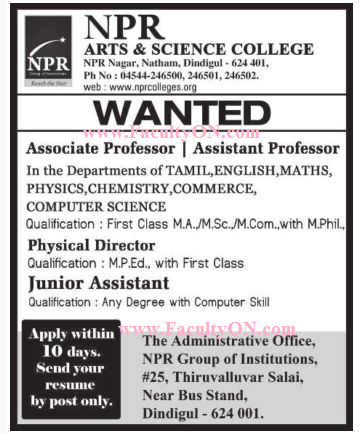 NPR Arts and Science College, Dindigull has advertised in the DINAMALAR newspaper for recruitment of Associate Professor / Assistant Professor Plus Non-Faculty jobs vacancies. Interested and eligible job aspirants are requested to apply within 10 days from 08th April 2018. Check out further more details below. About College: The N.P.R college of Arts and Science is the place for knowledge. Our main goal is to increase the population of graduates, widen external support for research, scholarships, and also meet the need of the students community by providing leadership, sponsorship and participation in academic and cultural events. The vital need of educating is just not to fill the minds of students with facts, it is to teach them to think.